President Trump arrived in Puerto Rico on Tuesday as the territory struggled to recover from Hurricane Maria, which has left nearly all of the island without power and most residents without water nearly two weeks later. At one brief stop at a church, Trump told the gathering that they no longer needed flashlights, and he tossed rolls of paper towels into the crowd as if they were basketballs. He took a helicopter tour, visited a ship, posed for selfies – and then left an hour earlier than scheduled. The whirlwind, four-hour visit came amid accusations that the Trump administration did not act quickly enough to help Puerto Rico and the U.S. Virgin Islands after Maria – and that the president paid less attention to the territories than to Texas after Hurricane Harvey and Florida after Hurricane Irma. Trump and his aides have responded by attacking critics and seeking to discount news coverage of Maria’s desperate aftermath. Soon after arriving, he turned what was supposed to be a private briefing on relief efforts into a televised pep talk, praising members of his administration and the military for their long hours responding to several hurricanes over the past 43 days. He uttered “great” 10 times and used “incredible” and “amazing” seven times each. 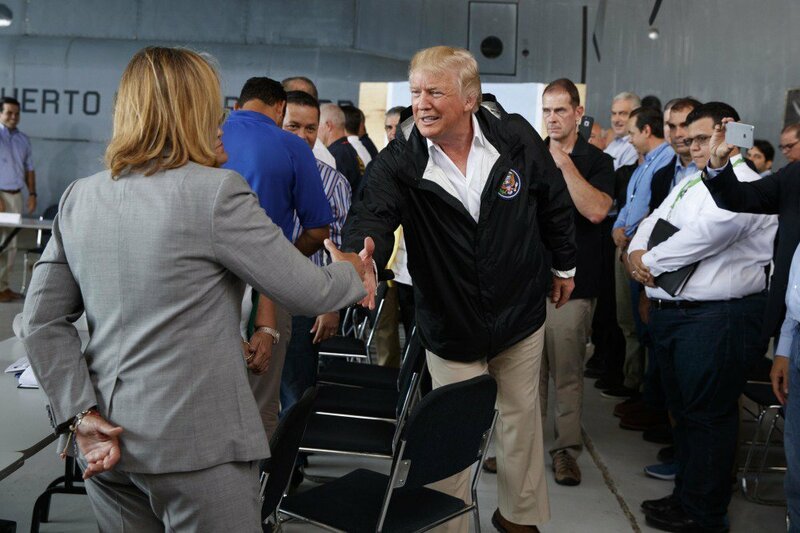 At one point, Trump asked the island’s representative to Congress, Jenniffer González-Colón, to repeat some of the “nice things” she had said in televised interviews. Senate Minority Leader Charles Schumer, D-N.Y., also said the president never complained about the costs imposed by Hurricanes Harvey or Irma. “Stop blaming Puerto Rico for the storm that devastated their shores,” he said. But Jason Miller, a former campaign official who worked on the president’s transition team, commended Trump’s approach to the visit. Trump stood behind a table filled with relief supplies, including flashlights, rice and paper towels. He threw rolls into the crowd and said, glancing at a pile of solar-powered flashlights: “Flashlights. you don’t need ’em anymore.” An estimated 95 percent of the island remains without electricity.